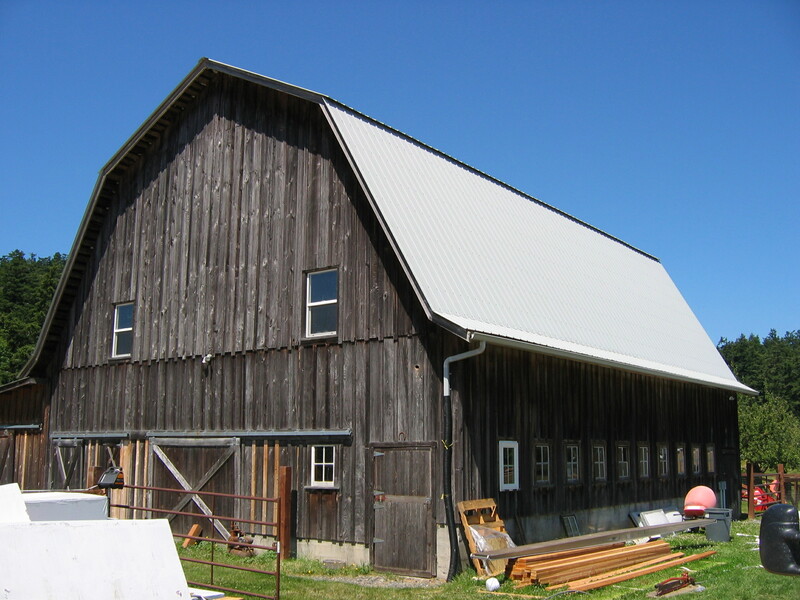 Gambrel Roofed Barns have a symmetrical roof with two slopes on each side (gambrel). An English Gambrel has eaves that extend straight past the walls. 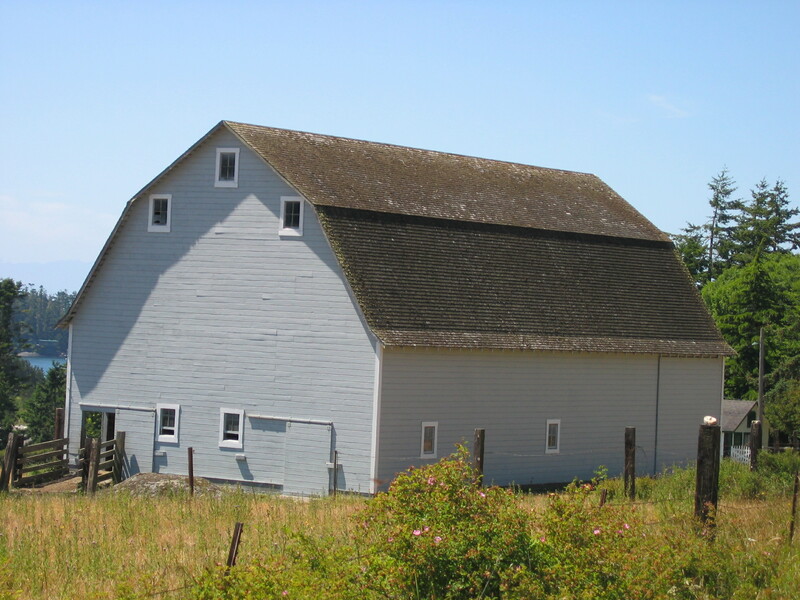 So far, there are no known English Gambrel Roofed barns in the San Juan Islands; there are only Dutch Gambrel. Dutch Gambrels are distinguished by the slight flare at the eave line of a gambrel roof, once referred to as a “Dutch Knuckle.” They were a fairly common design for dairy farms in the 1910s-1930s, and were commonly featured in barn equipment manufacturer’s catalogues as well as the ‘kit’ designs of lumber companies. Arcady Farm, Orcas Island. The barn on Arcady Farm is one of a complex of several farm buildings, including a machine shed, chicken coop, water tower, and several garages and sheds. Constructed as a dairy barn, it features a 4′ high concrete stem wall supporting a wood-frame lower story for milking stanchions and stalls and wood-truss upper story for the loft. The loft features a wooden hay rail with trolley and hay hood and doors on the north façade. An interesting feature is a wooden ventilation shaft that extends from the lower story along the inside of the middle of the west wall to the roof ridge, topped by a metal ventilator. The barn measures 30′ wide by 36′ long and is 29′ high (first story 10′ and hay loft 19′). 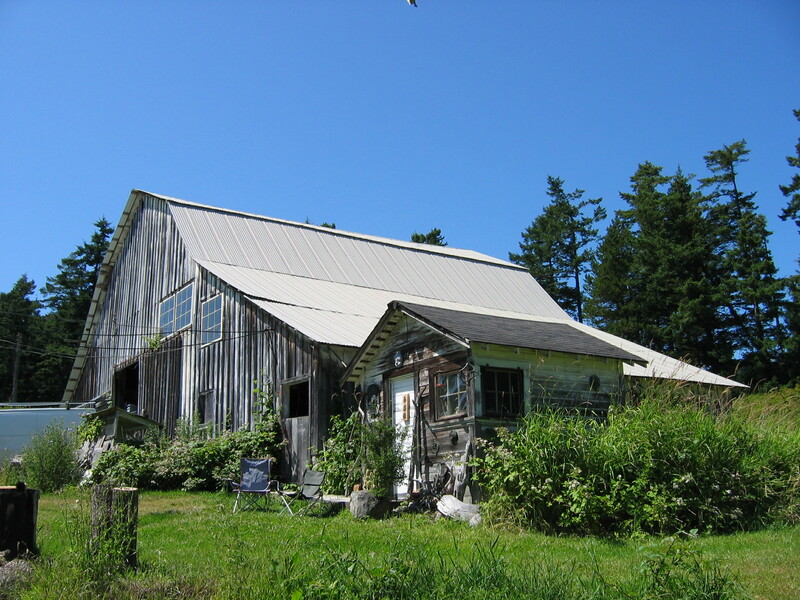 Bret Barn, Orcas Island. The Bret barn is a simple gambrel-roofed structure constructed of log posts and cross beams and braces with a milled lumber frame. It measures 30’6″wide by 39’9″ long and is 28’6″ high. It was probably all one open space, given that it has a hay door with hood and wooden track and trolley system; it currently has a loft. Joe Burt Farm Barn, Lopez Island. 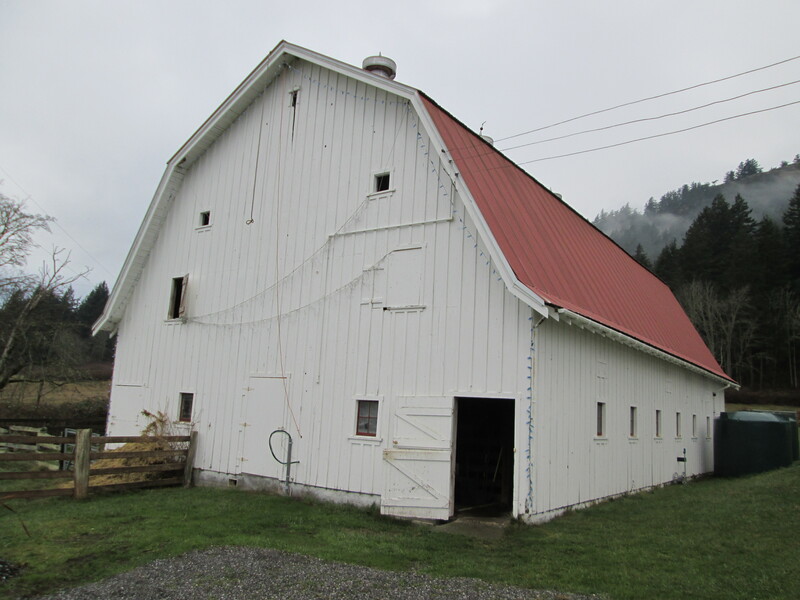 This barn is one of several agricultural structures on the farm, including a granary, milk house, and machine shed. The main, 30′ wide by 60′ long, portion under the gambrel roof is two stories, with a 10′-high ground floor and a 28’8″-high hay loft. The shed to the east has stalls. The structure is milled wood post-and-beam, and there is an ingenious hay elevator that takes bales from the ground level up into the loft and then along the upper part of the loft for placement. Tommy Davis Barn, San Juan Island. Built by Tommy Davis ca. 1927, in part with lumber from the old mill at Argyle, this was designed as a dairy barn, with a lower, concrete and brick story used for milking cows and an upper, wood-frame loft used for hay storage. The plan and design were fairly standard at the time; various barn equipment manufacturers and even ‘kit’ companies featured similar plans. At one time, there was also a silo and pea-viner on the south side of the structure. The structure is 36′ wide by 72′ long , with an 18′-wide shed on the downhill or west side. There is a metal hay rail and trolley and a hay hood and door on the north side. William Hare Barn, Orcas Island. Built as a dairy barn, this structure is sited on a steep slope, with a post and beam lower floor (supported on concrete piers) and a wood-truss loft. The barn features a concrete stem wall and floor built into the slope, with an adjoining milk house, an interior hay drop, a wood hay rail with trolley, and hay door and hood on the west side. The structure is oriented east-west, and measures 38′ wide by 42′ long, with a 8’6″ lower floor and 24′ loft. Owen Higgins Barn, Lopez Island. 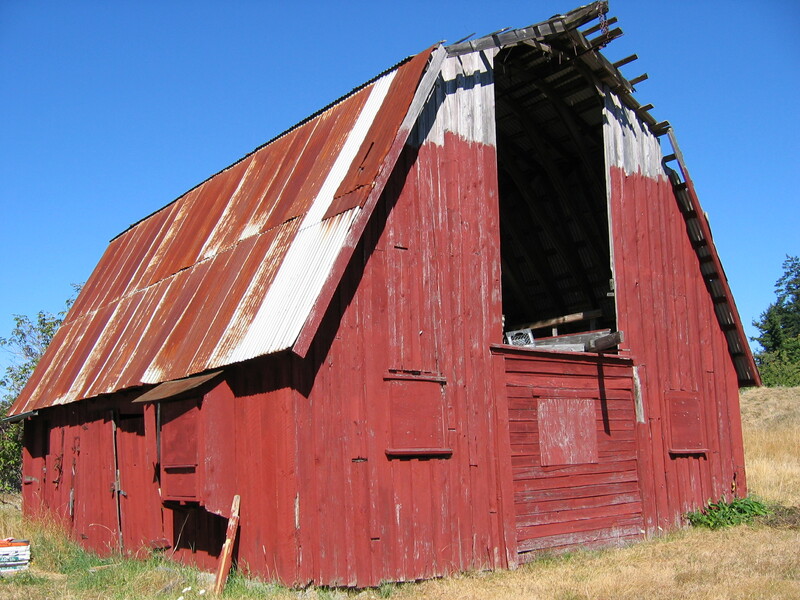 Built by Owen Higgins in 1938, this was used as a dairy barn until 1955, when the San Juan Dairyman’s Association stopped picking up cream on Lopez for the creamery in Friday Harbor. Higgins, who was a carpenter and shipwright, built the barn himself. 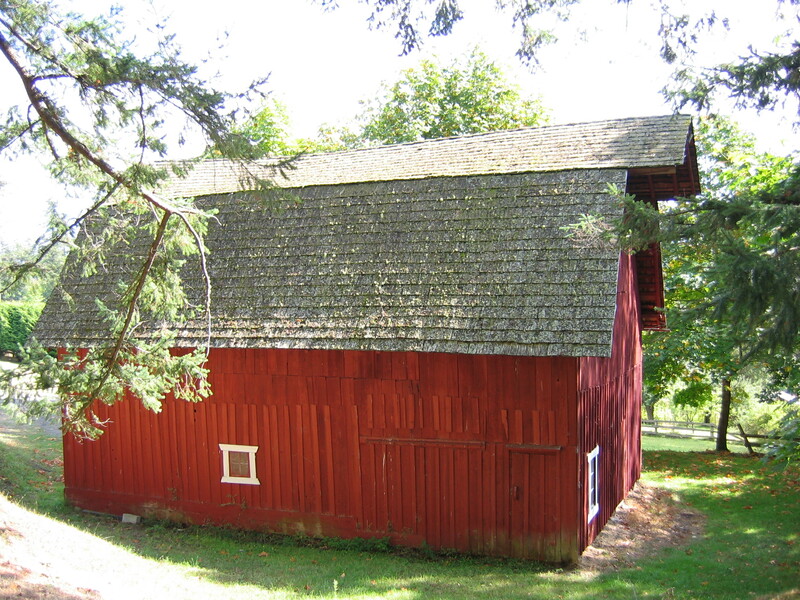 The Dutch gambrel roofed structure measures 38’6″ wide by 72’6″ long and is 38′ high. 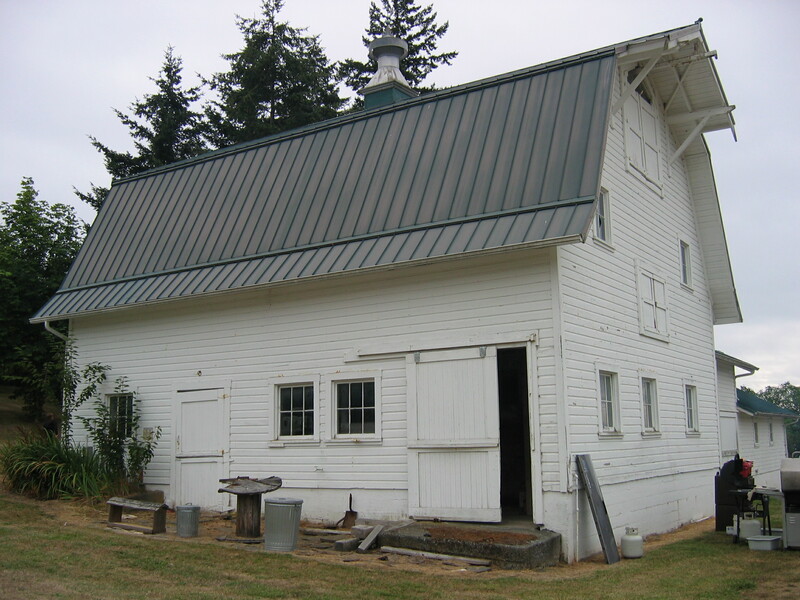 It is listed on the Washington Heritage Barn Register. Carl Lehman Barn, Orcas Island. Designed by owner Carl Lehman and built with Ray Pineo, this barn was constructed in 1946 on the 160-acre Deep Meadow Farm. Outbuildings included a farm house, milk house, and chicken house. The barn was used as a dairy barn, with concrete stem walls and floor, and stanchions and manure gutters. The lower story is wood frame, while the loft is wooden-truss. The loft features a metal hay rail, trolley, and hay door with hood on the north side. Oriented north-south, the structure is 38′ wide by 50′ long, with a 20′-wide shed on the west side; the lower floor is 8′ high with a 24′ loft. William Loos Barn, Orcas Island. 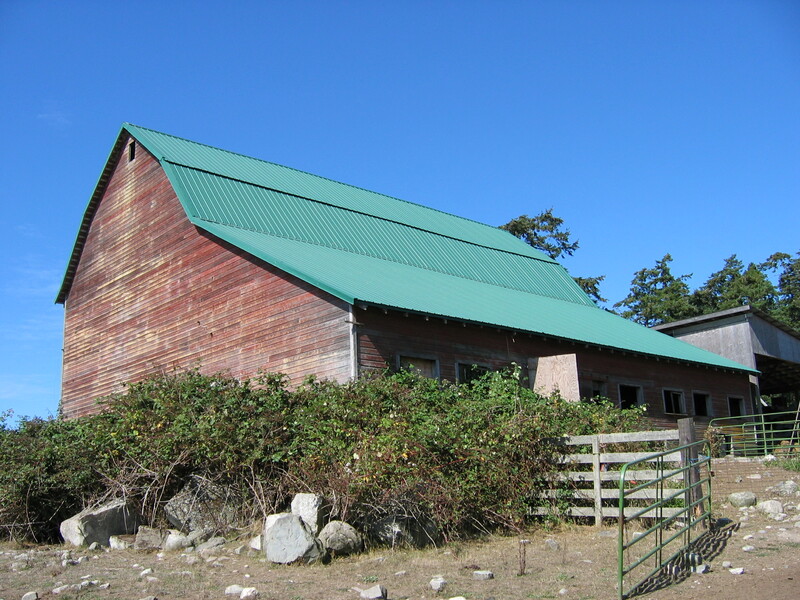 According to Ray McBride, William Loos built this barn on Indian Point in the 1930s, and in the 1950s his grandson Ed Lavender move it to Eastsound, where it stands today. Most gambrel-roofed barns in the islands are “Dutch,” having a “knuckle” or upturned eave, but this one is “English,” having a straight slope at the eave. Two stories with a center drive, it had a hay door and hood with a steel hay track and trolley. Mathesius Farm, Orcas Island. The barn on the Mathesius Farm is one of a complex of several farm buildings, at one time including both a small and large milk house, hog barn, machine shed, and a farm house. 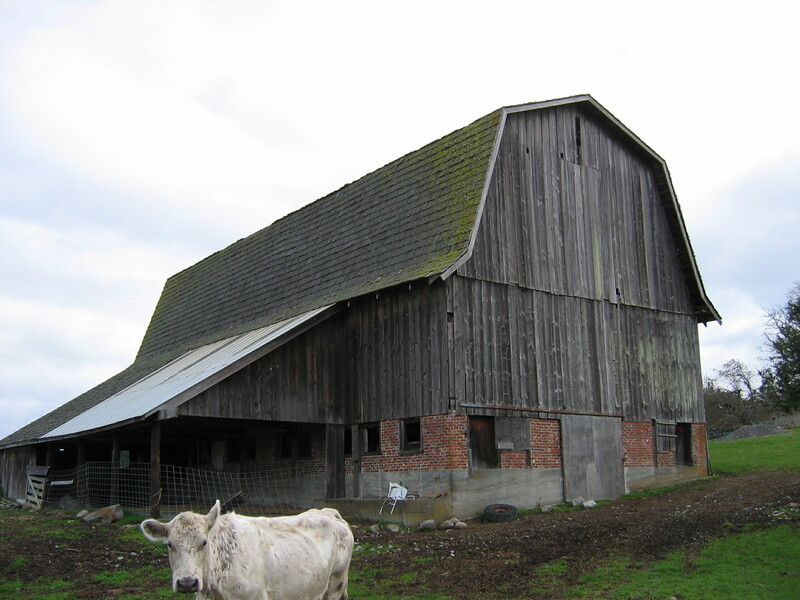 Designed as a dairy barn, it has concrete floors and stem wall, with a wood-frame lower story and wood-truss hay loft. Interesting features include wooden stanchions, poured concrete manure gutters, and thee metal ventilators. Oriented east-west, the structure measures 42′ wide by 64′ long, with an overall height of 44′ (9’6″ on the lower floor; 34’6″ for the loft). The Barn at Skyloft Ranch, Orcas Island. Built in the 1900s on land originally homestead by Oberlin T. Loos, this barn was part of a dairy operation that provided milk and cream to the Deer Harbor area. The main section under the gambrel roof, which measures 38’5″ wide by 42′ long and is 29’4″ high, contained the hay mow; sheds were added on the southwest side for stalls and on the northeast side as a milking shed. The latter features stanchions and mangers as well as a manure gutter for the milk cows and is illuminated with a row of windows. To the northeast is a separate milk house that is connected by means of a concrete walkway. Burt Weeks Barn, Lopez Island. 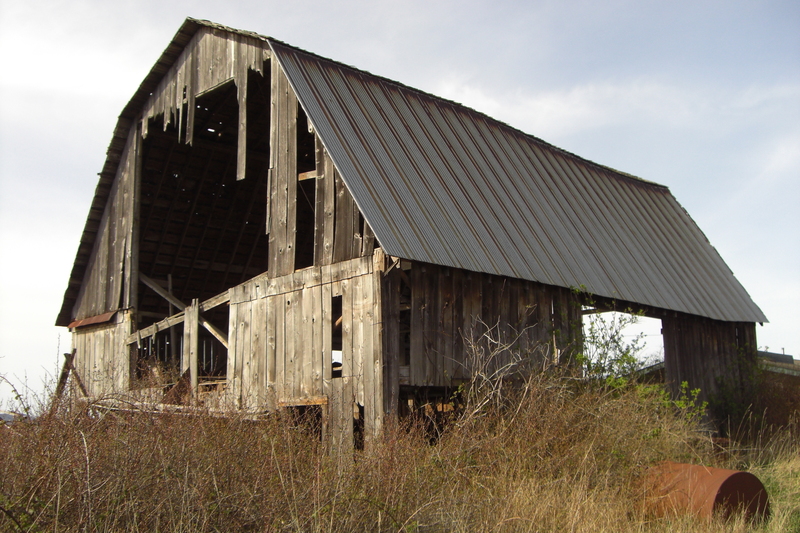 This structure, while in poor condition, shows signs of having been a substantial dairy barn. Constructed of wood frame with milled members, it measures 38′ wide by 44′ long and is 28’8″ high. The gambrel roof covers a central hay mow that was filled by means of a hay track and trolley system. Doors in the middle of the sides accessed the mow as well as horse stalls and cow stanchions flanking a center aisle on the south side. Wooden Shoe Farm New Barn, San Juan Valley, San Juan Island. When Fred Zylstra established Wooden Shoe Farm in 1960, he refurbished the old agricultural buildings and built new ones, including this gambrel-roofed hay barn.. It was built in 1963 by Bill Funk, the skipper of his yacht–who was also a handyman. 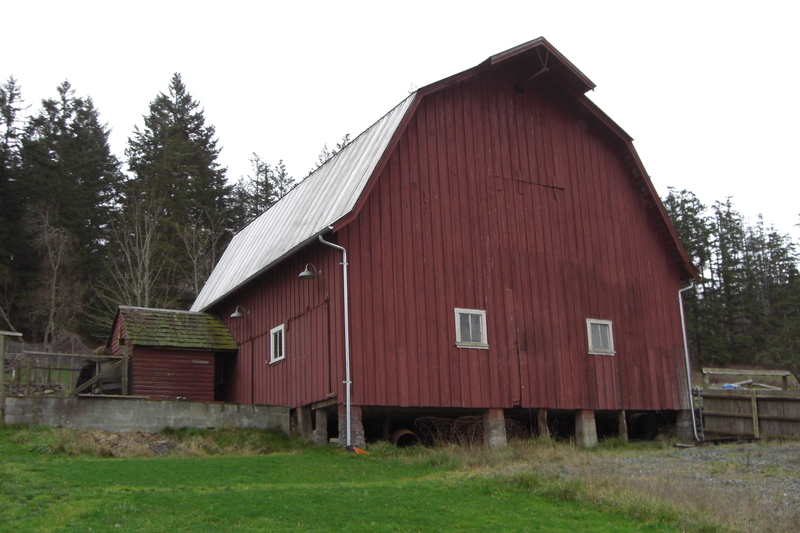 The barn, which measures 67′ by 100′ and is 30′ 6′ high at the ridge. There are extensive mangers or feeding troughs along one side.